CEDIA Expo 2018 includes 5 new exhibitors showing services and software for home-technology businesses -- everything from new-construction leads to field-service management software. Service Fusion for field-services management and Construction Monitor for new-construction leads, are just two of the new exhibitors at CEDIA Expo 2018 showing business-related software and services. CE Pro continues to scour the virtual CEDIA Expo 2018 show floor, discovering new exhibitors, as well as companies that at least sound new to us. Today, we look at some of the newcomers offering business tools for integrators. AV Junction is a brand new company that pairs integration firms with techs looking for work. 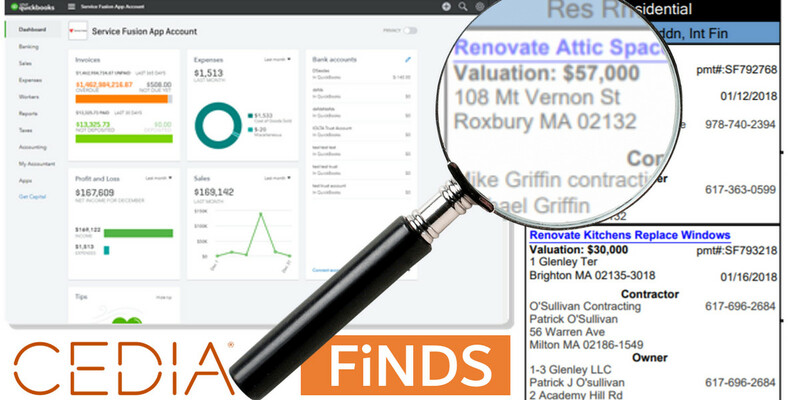 Construction Monitor provides leads and data related to construction permits. Service Fusion offers field service monitoring software. And two other CEDIA newcomers will build Websites and create marketing materials for integration businesses. Meanwhile, Emerald Expositions, the company that acquired CEDIA Expo last year, is still looking to fill up "Innovation Alley," where young companies can get a good deal on an all-inclusive booth. This matchmaking company pairs integration firms with freelance A/V pros via an online platform for buyers and sellers. AV Junction itself doesn't do the vetting and match-making, but provides the tools for hirers and hirees to determine if any particular project is a good fit. Freelancers build profiles with their credentials; employers post project details. Either can browse the databases or search for keywords, and freelancers can elect to be messaged about new projects. AV Junction takes a cut of up to 8% on the total invoiced amount. 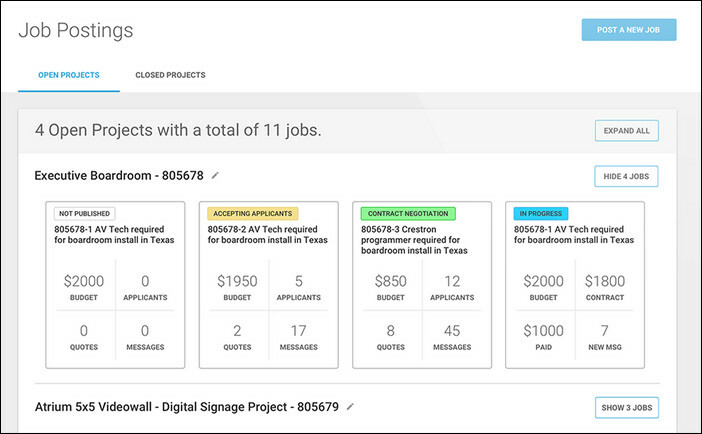 The company, which exhibited recently at Infocomm, says it has more than 800 "freelancers" and 250 hiring companies in its growing database, mostly in the U.S., UK and Canada, but a few sprinkled throughout 20 other countries. Integrators are starting to do a really good job managing projects and inventory with the software provided to the home-technology channel; however, field service management still remains a sticking point for many companies that juggle multiple jobs and field techs simultaneously. Service Fusion provides many of the usual job-estimating and equipment-tracking tools provided by traditional software providers in the channel, but it also adds a sophisticated field-management engine to the mix. The company's multi-platform service allows managers to schedule and dispatch jobs via text message and mobile app. They can also follow activity in the field via GPS fleet tracking built into the system, all of which can be incorporated into the software's time-tracking and payroll reports. There's a customer-facing app as well -- branded with the service-provider's own logos and messaging -- that keeps the customer in the loop. The system can remind customers of upcoming service, and let them know when a tech is on the way. Email is integrated into the software, so dealers can send estimates, job confirmations and invoices without leaving the Service Fusion environment. Service Fusion offers bi-directional synchronization with QuickBooks. 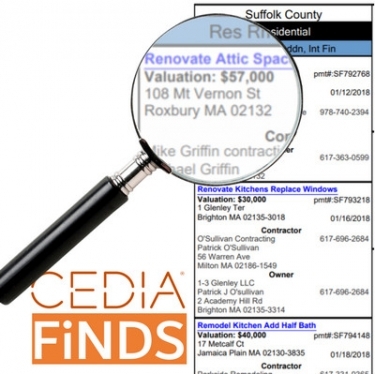 For years, the CEDIA community has benefited from longtime exhibitor Homeowner's Marketing Services, a company that sells mailing lists of new home owners -- and not just any mailing lists but the "freshest list available," the company claims. This year at the Expo, dealers will meet a competitor, Construction Monitor, which gets dealers in the door even before the new homeowners arrive. This marketing company provides data on building and solar permits, including contact information for the builder/owner and contractors. Users can select from a variety of construction and permit types, such as single-family homes, swimming pools, churches, roofing, apartments and demolitions. They can search by city, subdivision, permit status and a number of other parameters. Customers also gain access to Construction Monitor's wide range of statistics and trend reports. I have been using Construction Monitor for years. A long time ago, before discovering this wonderful service, I had to drive from city planning room to city planning room and that took up a lot of time and gas. Having the fully detailed report sent to me every week is such a treat. I look forward to seeing all the new jobs that I can pursue. This report it a great resource for sub-contractors that searching for more work. This report will work, but one has to put the time and effort into working all these leads that pertain to ones' trade. In just one year I was able to uncover over $1,000,000 of new business. Two new(ish) exhibitors at CEDIA Expo will join several established companies peddling website development to home-tech integrators. Real Content Solutions isn't listed as "new" on the Expo site, but it's new to me, so it makes the list. The company says it "enables clients to efficiently and affordably execute digital marketing strategies" with video production, photography, graphic design, editorial content and Web development. Qubuz focuses more on the design component of marketing, creating logos, advertisements and complete Websites ... judging by Google's translation of the Dutch site. Neither company focuses on the custom-installation channel per se.